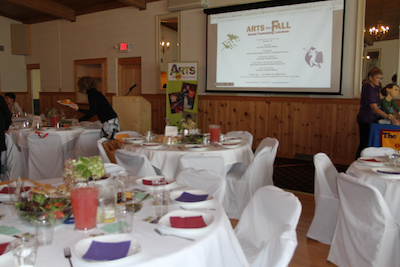 Thank you so much to the 120 friends and supporters who joined us for our 4th annual Arts for Fall fundraising luncheon, held October 27 at Bluewater Hall. Kat Brown, left, and Denni Don Hunting give a Kids on the Block show. We raised $10,000 to help us fund existing and new programs in our five-county region for children and adults with disabilities. 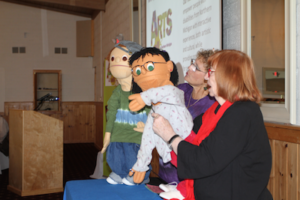 These include Kids on the Block puppet shows, ACCESS GT, our Winter Art Escapes workshops and seasonal dances. Speaker Jenifer Strauss of Stories Be Told gave examples of her students’ growth through the universal art of storytelling. 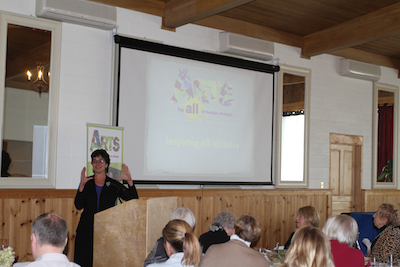 Executive director Dayna Ryan and board member Kerri Otto shared A4A’s many accomplishments over the past year, including our name change and new branding, and plans for the upcoming year, such as our Arts for All spring festival. Board member Nick Edson shared a personal Arts for All experience and encouraged guests to join him in supporting our future efforts. A big thanks to our generous sponsors — Rhonda and Michael Estes, Bay Masonry LLC, Twisted Fish Gallery and Lawton Gallagher. 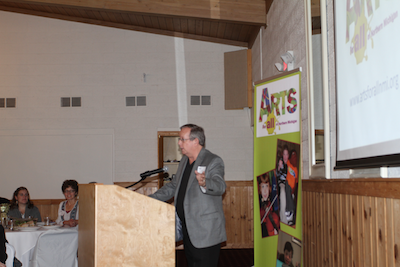 It’s not too late to help with inclusive arts education in our community. Join our Giving Gallery or learn about other ways to help. Jenifer Strauss of Stories Be Told is one of our most popular artists. Nick Edson tells of a personal connection with Arts for All.